On Saturdays, I liked to take the Corydon bus downtown to Portage and Hargrave and spend my allowance at Bookfair. This was in the early eighties when Bookfair was still quite a large store whose front section of used paperbacks half-concealed an enormous showroom of new comics and back-issue bins. What I was there for, though, were the 25-cent bins at the very back of the store: voluminous, neatly-kept, and filled with a surprising abundance of relatively new comics that other kids like me had brought in to exchange for store credit. Those were the days, huh? Hard to imagine bringing in an old pile of comics to your neighborhood store today and being given a choice of “cash” (30% of their resale value) or “trade” (50% of their resale value, which could be “spent” in the 25-cent bins). Even if you could, they would be dollar bins now, I suppose. But that was Bookfair in Winnipeg, 1983. Browsing through those bins was exciting, of course. It was the main way that I tried new things and rediscovered old ones. Swamp Thing. All-Star Squadron. Dazzler. Avengers. Uncanny X-Men. Night Force. Legion of Superheroes. Somerset Holmes. Evangeline. Elric. It’s also where I began “filling in” my first collections: The New Teen Titans, for instance, which I had really only started collecting with issue 21. The bins were wonderful, but it’s the transactions at the counter that really stay with me. These exchanges of money for comics—or even better, comics for comics—were exciting and intimidating in a way that is difficult to explain adequately from the perspective of adulthood when the act of buying something has become second-nature. What accounted for this mixture of excitement and nervousness that accompanied these transactions? Perhaps it had something to do with the fact that Bookfair seemed to be run entirely by middle-aged women whose (to me inexplicable) knowledge of comic books (and, it must be said, pornographic magazines) gave them a curiously witchy aspect. The unsettling thing about them was that they were my mother’s age, and yet they had an intimate knowledge of a largely male world that (I imagined) my mother had no interest in, did not approve of, and would hardly have traded in, much less superintended! These “weird sisters” (as I think of them now) were not friendly and did not smile. And they imbued Bookfair with a kind of sinister glamour that made the store into a sort of pocket universe, a liminal place where the regular rules that governed my life and my sense of the order of things no longer quite applied. This was a place where children’s pleasures brushed up against the scary but coveted world of adult things, and the counter was the site of that fraught but thrilling exchange. The woman with short grey hair and butterfly-frame glasses is the one I remember best and most fondly. It goes without saying that I never learned her name, but I have a vivid memory of standing at the counter on any number of occasions as she sorted the pile of comics I’d brought to trade. Her face was all business. She separated my stack into comics she was willing to take and comics she would pass on, checking the spines to make sure they weren’t curled or opening a comic to the middle to check the snugness of the staples. 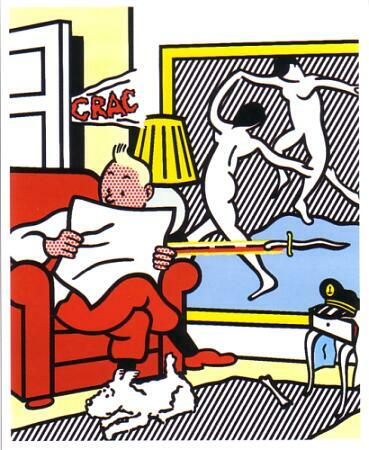 I admired the thoroughness of her inspection and held my breath in anticipation of which comics would make the cut. Sometimes, if most of the comics were good, she’d throw the few rejects back onto the pile and say, “four dollars for the lot.” But that was rare. Usually, when she was satisfied, she’d square the stack of good ones on the counter, count them up, and make a calculation on the small noisy adding-machine that printed receipts on a spool of white paper. Finding out how much you had to spend was almost as much fun as spending it. Of course, the receipt wasn’t for you, but for the store. The grey-haired woman would remember who you were when you went up to pay. In the meantime, she would write down the value of your trade on a scrap of paper taped to the counter by the cash register—a scrap of paper that contained numerous other (mostly crossed-out) sums. After you’d made your selections from the 25-cent bins, she’d cross out your sum too and everything would balance, even if you had to top up your credit with a few dollars from your allowance. If you had trade dollars left over, you left the store with your pile of new comics and a credit receipt in you pocket for next time. It was magic, of a kind. DC’s Helmet of Fate event has been really quite good so far. 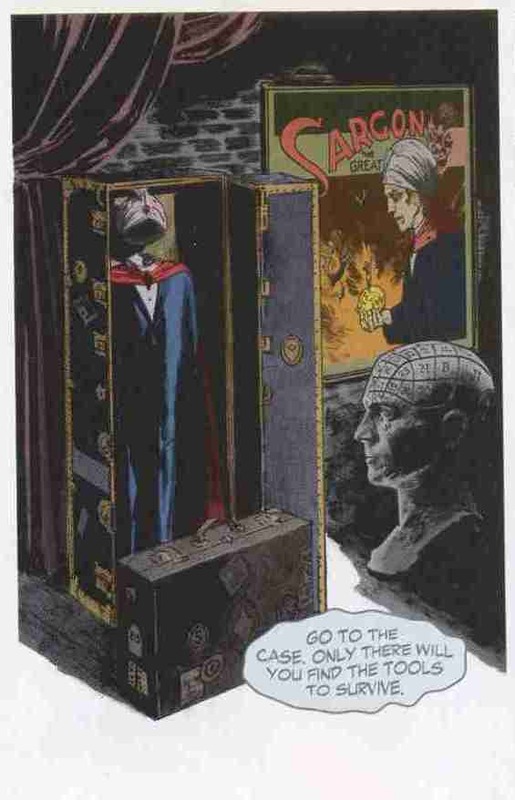 The premise of this series of loosely linked one-shots is that Fate’s helmet is flying through the magical quadrant of the DC universe looking for a suitable candidate to serve as the new Doctor Fate, a format that allows each writer/artist team to explore a different magic-based character for a single issue before the helmet moves on to its next stop on the magical mystery tour. 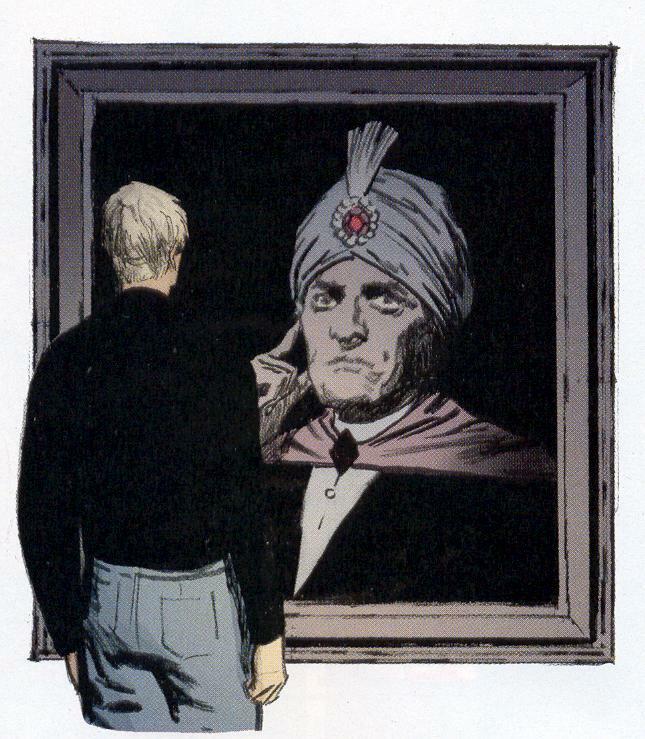 There are lots of ways this kind of thing could flop, but so far the quality of both the stories and the art has been top-notch, and the reintroduction of DC’s obscure magicians and sorcerers has been a truly delightful journey. What I’m especially enjoying about the series is its tone. Unlike the more comedic superhero/sorcery hybrid Shadowpact (which went from great to so-so as it leapt from miniseries to monthly), these stories treat their subjects with a touch of gravity and wonder that recalls Vertigo’s Books of Magic and that I hope the upcoming Dr. Fate series will run with. This pitch-perfect tone is particularly evident in the two strongest issues of the event to date: Ibis the Invincible #1 and Sargon the Sorcerer #1. In the former, Tad Williams and Phil Winslade chronicle an Egyptian-American boy’s Captain Marvel-like transformation into an ancient Egyptian sorcerer; in the latter, Steve Niles and Scott Hampton tell a wonderfully gloomy story of inheritance and revenge as down-and-out drifter, David Sargent is tricked into assuming his grandfather’s identity as the sorcerer Sargon. Both books are blessed with the kind of dark, creepy artwork that I wish we saw more of in contemporary comics. Of the two stories, Ibis is somewhat lighter and jauntier, but Winslade’s art keeps the mood sinister and foreboding, particularly in his pulp-style rendering of the Egyptian tombs, sarcophagi, and ancient gods. Scott Hampton’s work on the attics and alcoves of Sargon’s gothic mansion is equally strong; here too, he is clearly drawing on an older pulp tradition of gothic interiors, complete with suits of armor and grim family portraits. These two issues are in a completely different class than DC’s other current mainstream magic offerings, Tales of the Unexpected and Shadowpact, and I would gladly buy either Ibis or Sargon as monthlies with these creative teams at work on them. The opening chapter starring Willingham’s somewhat too precious Detective Chimp (art by Dr. Fate alum Shawn McManus) and the most recent issue featuring Gail Simone’s Black Alice (Duncan Rouleau on pencils) are not as much to my taste, but both are respectable entries. Of course, what the classic-creepy goodness of Ibis and Sargon is really arousing in me is my old desire for a rapprochement between the horror titles that ended up in the Vertigo line—Swamp Thing and Hellblazer—and the mainstream DC universe. Since this is unlikely to happen, let me once again register my plea for a reintegration of horror comics more generally into the DCU. A better Spectre series would be a good start (how I miss the old Moench/Colan Spectre with Madame Xanadu and her tarot readings! ), but the two other obvious contenders for revival are I…Vampire (once Lord Andrew Bennett decamps from the high camp back-up in Tales of the Unexpected) and Night Force (the Wolfman/Colan version, of course). Either one of these dusty concepts could serve as the basis for a Swamp Thing-style injection of horror into the DCU—in the right hands. That is, provided that they are not played for laughs. In the meantime, I’ll be keeping my eye on Dr. Fate. Watching Joe Quesada and Mark Millar destroy the Marvel universe has been no fun at all. In fact—and pardon my hysteria—it’s even felt a little bit sinister. A bit? Okay: very sinister. Or maybe that should just be cynical. How does one assess the motives of storytelling this reactionary? Sure, sure. Cap’s “radicalized underground” (!) is still out there, no doubt itching to carry on the good fight against Tony’s evil (oops, I mean “equally valid”) machinations. And heck, maybe we’re even supposed to see that last panel as irony. But you know what? It doesn’t matter, because the problem with this stupendously awful series is bigger than whose side “wins.” Much bigger. I’m referring to the fact that this series has changed the way we “read” Marvel superheroes, a change that has something to do with the political content of the story, but even more to do with its form. Wishful thinker that I am, I sometimes delude myself into thinking of superhero comics as a progressive, sub-cultural pocket of the mainstream media that has at least a minimal investment in challenging particularly odious forms of authority and orthodoxy. And there might even be some justification for this semi-delusional way of thinking, despite the obvious rejoinder that comics are just a storytelling medium like any other and are home to stories that implicitly or explicitly endorse any number of political positions. Despite, too, the equally inevitable rejoinder that superheroes are inherently “fascistic” or “authoritarian,” a topic that has been explored (and refuted?) both intelligently and otherwise within the medium itself (Watchmen, The Authority, The Boys, etc.). The argument against both of these claims—and against the claim for the inherent conservatism of the superhero genre in particular—is basically formal and goes something like this: Superheroes are not real. Superhero comics are therefore fantasies. That is, they present events that break with reality and in so doing suggest ways in which “reality” as we commonly know it is inadequate or dissatisfying. Fantasy is always, in some sense, a critique of the present. If we take the fantasy of the superhero literally, it is easy to see how it could be described as a sinister longing for fascist solutions and transformations. But must we take the fantasy literally? Not necessarily. Like any literary work that depicts events that do not happen in real life, the superhero comic and its superhero fantasy can also be taken metaphorically. And when we read superheroes as metaphors (or better yet, as symbols), their meaning—especially their political meaning—is no longer so simple or so certain. This ambiguity about how to interpret the fact of the fantasy itself (which is a formal feature of the genre) is why the superhero can be either a terrifying ubermensch or a liberating metaphor depending on how you read him (or her)—and is often both of these things simultaneously. The reason Civil War has felt so flat and depressing from the beginning is that its architects have done everything possible to completely jettison the liberating (and less rigidly fixed)metaphorical reading of the superhero in favor of a dreary literalism that can produce only the most plodding and banal of political allegories. What if there really were superheroes?, Civil War asks earnestly. The inevitable answer follows: they’d have to register with the government! This, I submit, is a silly question that not only serves as a pretext for a rather unsavory civics lesson, but also calls forth a particularly limited form of reading. In other words, it isn’t just that the conclusion of Civil War is morally bankrupt (which it is), but that, like the rest of the series, its overblown political allegory removes the ambiguity of the superhero fantasy itself and thus robs the series of the rich metaphorical resonance that made us all fall in love with superheroes in the first place. In the new Marvel universe, we no longer have to think about the metaphor of the superhero and what it might mean in political terms or in any other terms for that matter. 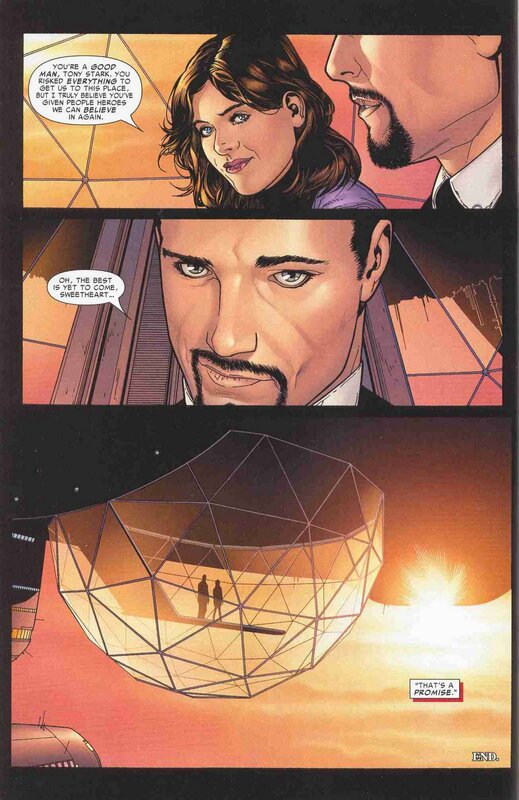 Joe Quesada and Mark Millar have already done our allegorizing for us. By contrast, the allegory of Civil War has about as much complexity as Pilgrim’s Progress. And this is reflected in the utter flatness of the miniseries’s treatment of character (something that always suffers in works of pure allegory). People (not me) accuse Geoff Johns of “action-figure” plotting; Mark Millar’s messy script for Civil War makes him the true owner of this mantle, and the lack of characterization in the series isn’t helped by Steve McNiven’s pretty pencils. Yes, McNiven is a very talented guy, but all you see on any given page of Civil War is McNiven—the characters themselves are just posed, empty figures. Marvel has always distinguished itself from DC by rooting its stories more firmly in “the real world”—and Civil War is certainly in keeping with this tradition. It’s just too bad that by rooting its superheroes so uncompromisingly in a “real world” allegory it’s made a mockery of its own internal history, turned half its cast into monsters, and reorganized its universe into a place I can no longer recognize as a space of meaningful fantasy.